Can a Mattress Really Enhance an Active Lifestyle? I have sleep problems. In fact, I recently had a genetic profile taken that indicated my genes actually make me more susceptible to sleep disturbances. Add to that my night owl tendencies, chronic low back pain, bed-sharing with three large dogs (and a husband) and my husband's work schedule that has him up at 5:30 am, and I'm pretty much lucky to get six undisturbed hours of sleep. It's terrible. The whole cycle makes me unfocused and sluggish, which is a problem when trying to juggle work, life, and regular exercise. And the research certainly points to how important sleep is for exercise performance. When Bear Mattress offered to send me one of their performance mattresses for review—mattresses that claim to improve sleep and reduce time awake during the night—I said, "Yes, please." Bear Mattress, like many up-and-coming mattress companies, offers a web-first presence that cuts out the typical mattress outlet middleman. It may seem scary to order a mattress online that you haven't test-driven in-store, but these mattress companies typically offer 90- or 100-night risk-free, in-home trials. Bear Mattress, for instance, offers100 nights to test the mattress. If at any point during the trial you decide the mattress isn't for you, you can send it back—the company provides free shipping—no questions asked. Plus, by cutting out the middleman, you enjoy extra savings. 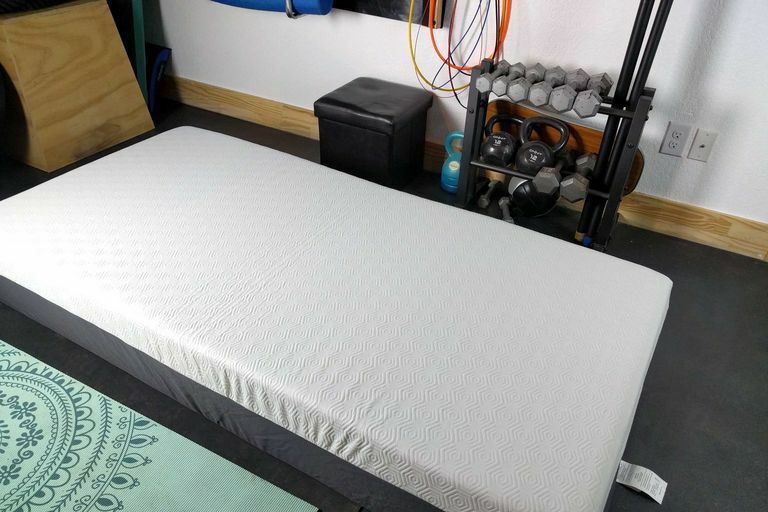 Bear Mattress' king-sized beds cost less than $1,000, which still isn't cheap, but it's a whole lot less expensive than other comparable performance-focused mattresses. For instance, Essentia mattresses start at $2,300 and go up from there. My husband and I actually purchased a mattress from a similar, web-first company, Casper, a year ago. At the time we found the process to be seamless and easy, and my husband loved the mattress, so we kept it. Unfortunately, I did not love the mattress—it was too firm for my liking and exacerbated my low back pain, which sent me on a year of test-driving pillows and mattress pads to help improve my sleep. This is why I was thrilled to review the Bear Mattress. What Is a "Performance" Mattress? Whenever I hear the word "performance" attached to a sleep product, I raise my eyebrows a bit. It's not that it's a bad turn of phrase—in fact, I've loved practically every performance pillow, sheet set (and now mattress) that I've tried, but it always sounds a bit, well, marketed. It makes me ask the question, "How? How, exactly, does this qualify as a performance product?" In the case of Bear Mattresses, the answer is clear: Celliant fabric. I won't try to pretend I understand the fabric completely because I can't quite wrap my mind around how mineral-infused fibers somehow improve circulation and oxygenation, but I've read the studies, and it does seem to do exactly what it claims. In fact, a preliminary sleep study performed in 2009 found that individuals who used a Celliant-fiber mattress cover for two weeks didn't spend as much time awake in bed after initially falling asleep, and experienced more restful sleep overall. Some of the participants also experienced a reduction in chronic low back pain. In addition to the Celliant-infused fabric used to cover the Bear Mattresses, each mattress also uses Graphite-Gel infused Memory Foam to enhance air flow and help you sleep cool. For review purposes, I received a Twin XL mattress. All the mattresses are designed the same way, except for size, so it's a good representation of their products as a whole. The receiving and unboxing process was simple—open the box, remove the mattress, and cut through the wrapping with the provided blade. The mattress unfolds and within a few minutes the foam (which has been compressed for shipping) expands and the mattress is ready to use. The picture provided shows the mattress shortly after I removed it from the box. My immediate impression after lying down on the mattress was, "Ahhhhhhh." As I said before, one of my biggest complaints about the mattress we purchased from Casper was that the foam was too unforgiving. With my chronic low back and hip pain, I need memory foam that has some bounce and that will sufficiently cradle my body. This is particularly true since I tend to be a side and stomach sleeper. I love this mattress. Truly. When I sleep on the Bear Mattress, I sleep. I'm out like a light. I sleep hard and I feel rested, even if I don't get as many total hours of shut-eye as I'd like. That said, it didn't provide instant relief for my low back pain. Left to my own devices, I always seem to roll onto my stomach during the night, which inevitably causes my low back to hyperextend and begin to ache. The only way to counteract this is to sleep with a giant, full-body pillow that prevents me from rolling over. I was hoping I could ditch the body pillow with the help of the Bear Mattress, but unfortunately, the mattress couldn't solve all my problems. I still need my giant pillow to help protect my back. With the combined effect of my pillow and the new mattress, though, I slept better than I've slept probably in years. The comfort-level of the cushioning is five-star level comfort. And while I can't know whether my circulation and skin-oxygenation improved to enhance recovery, I can say confidently that the bed made me feel good. Remember how I said I share my bed with my dogs? Three large dogs? Well, they love the Bear Mattress as much as I do (if not more), and they wanted to share it with me every time I slept on it. This would have been fine with a larger bed, but the Twin XL size was too small for myself, three big dogs, and a giant, full-body pillow.